Arianespace is all set to launch four new navigation satellites for Europe’s Galileo network atop an Ariane 5 launcher. The rocket will lift off at 10:06 a.m. local time (8:06 a.m. EST / 13:06 GMT) on Thursday, Nov. 17, from the ELA-3 launch pad at the Guiana Space Center in Kourou, French Guiana. The mission, designated VA 233, marks the first time Galileo satellites will be delivered into space by Europe’s own booster, Ariane 5. All previous 14 spacecraft in the series were launched by the Russian Soyuz-STB rocket. The quartet of identical Galileo Full Operational Capability (FOC) satellites that will be launched on Thursday includes FOC M6 SAT-15 to SAT-18, based on consecutive Galileo spacecraft orbited to date. However, each of the four is also named after a child that had won the European Commission’s Galileo drawing competition. They received the designations FOC FM7 (Antonianna), FOC FM12 (Lisa), FOC FM13 (Kimberley), and FOC FM14 (Tijmen). The launch campaign for the mission commenced on Sept. 6 with the arrival of the four satellites in French Guiana. The spacecraft were then transferred to the Guiana Space Center’s S1A hall where the teams conducted fit checks from Sept. 8 to 12. Initial preparations of the launch vehicle started two weeks later when, on Sept. 27, Ariane 5’s cryogenic main stage, named EPC, was unpacked. The next day, the EPC stage was erected and two solid rocket boosters, called EAP, were attached to it on Sept. 30. Engineers prepare four Galileo FOC satellites for the upcoming Nov. 17 liftoff. Photo Credit: Arianespace. In mid-October, the Galileo satellites were delivered to the S3B hall for fueling operations that were carried out between Oct. 18 and 21. A few days later, the spacecraft were integrated onto the launch vehicle’s dispenser. Meanwhile, on Oct. 26, the assembled Ariane 5 rocket was transferred from the Launcher Integration Building (BIL) to the Final Assembly Building (BAF) in order to mount the payload on the launch vehicle. In the first days of November, engineers were busy integrating the satellites on the launcher and encapsulating them in the payload fairing. With the spacecraft encapsulated and attached to the launch vehicle, the rocket was ready for fueling its EPS upper stage, which took place on Nov. 8. Final preparations for liftoff began on Nov. 14 when the rocket passed the launch readiness review, which cleared the way for its rollout to the launch pad one day later. Engineers are now conducting last checks of the launch vehicle as the rocket awaits fueling operations of its main stage, commencing on Nov. 16. The countdown for liftoff is scheduled to begin 12 hours and eight minutes before ignition of Ariane 5’s solid boosters. The newest car-sized Galileo FOC spacecraft, which are about to be launched into orbit, have dimensions of 8.86 ft × 3.94 ft × 3.61 ft (2.7 m × 1.2 m × 1.1 m); however, with solar arrays deployed in space, they measure 48 feet (14.67 meters). 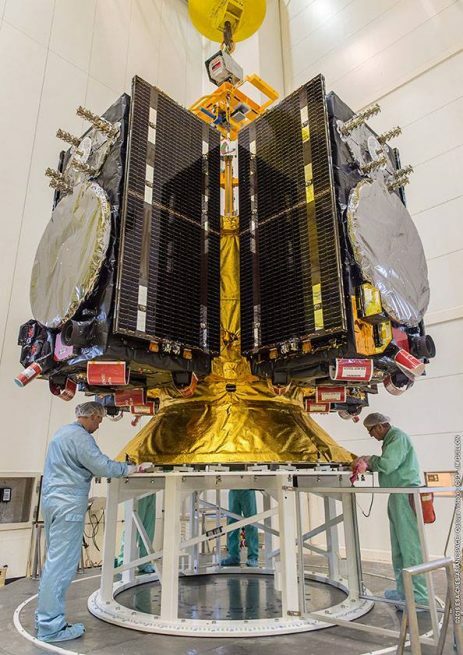 The Galileo FOC satellites FM12 and FM14 have an equal weight of 1,581 pounds (717 kilograms), whereas FM13 is 1,579 pounds (716 kilograms) and FM7 is the lightest with a weight of 1,577 pounds (715 kilograms). Built by OHB System, the satellites feature two solar arrays generating up to 1,900 watts of power during the designed lifetime of at least 12 years. The spacecraft are equipped with two passive hydrogen maser atomic clocks, two rubidium atomic clocks, a clock monitoring and control unit, one navigation signal generator unit, an L-band antenna for navigation signal transmission, a C-band antenna for uplink signal detection, two S-band antennas for telemetry and telecommand, and one search and rescue antenna. The payload was provided by SSTL. The quartet of Galileo FOC satellites will be inserted into a targeted operational circular medium-Earth orbit (MEO) at an altitude of 14,430 miles (23,222 kilometers), inclined 57.57 degrees. They will be separated from the launch vehicle after a nearly four-hour flight. With a mass of 770 metric tons, the Ariane 5 in its ES configuration, employed on Thursday’s launch, is an evolution of the initial Ariane 5 generic launcher. The 166-foot (50.5-meter) tall rocket has all the performance improvements of the well-known Ariane 5 ECA variant but replaces the ESC-A second stage with the restartable EPS. The flight is powered during the initial flight phase by a cryogenic main stage and two solid rocket boosters, followed by the use of a storable propellant upper stage for orbital injection of its passengers. The ES version is capable of delivering up to 21 metric tons into a low-Earth orbit (LEO). The Ariane 5 ES rocket was mainly used for launching ESA’s Automated Transfer Vehicle (ATV) to the International Space Station (ISS). From now through 2018, it will be utilized to send four Galileo navigation satellites into orbit on one mission. First flight of this variant took place in March 2008 when it launched the maiden ATV spacecraft named Jules Verne. The satellites that will be launched on Thursday belong to the Full Operational Capability phase of the constellation, which include the initial operational capability phase of 18 operational satellites. The full system should consist of 30 satellites, control centers located in Europe, and a network of sensor stations and uplink stations installed around the globe. The first Galileo satellites were launched on Oct. 21, 2011, atop a Soyuz rocket, whereas the first two FOC spacecraft were sent into orbit on Aug. 22, 2014. Thursday’s mission will be the 234th liftoff of an Ariane vehicle from the Kourou Spaceport. It was the sixth Ariane 5 launch of 2016 (the 89th Ariane 5 launch overall) and the ninth of 11 flights planned this year by Arianespace, utilizing its family of the heavy-lift Ariane 5, the medium-lift Soyuz, and the lightweight Vega. The company will conduct two more Galileo missions in the future, sending four satellites each. These flights are planned for the third quarter of 2017 and 2018. Arianespace’s next launch is scheduled for Dec. 5 when it is expected to deliver into space the Gokturk-1 reconnaissance satellite for the Turkish Armed Forces. That mission will be performed by the Vega launcher, lifting off from Kourou.